MODEL: WCD - 06 / 08 SERIES: The Capacitor Discharge type welding being a highly versatile process of welding studs, pins and other fasteners, overcomes the conventional method of through bolting, tapping, hand welding or riveting process. 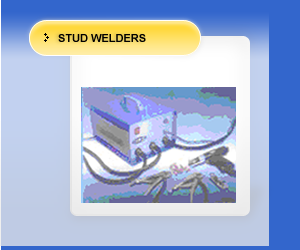 When consistently reliable and accurate welding applications are required in fabrication of control panels, automobile body building, rail coaches, testing equipments, insulation or any other such crucial applications, WELDCRAFT'S Capacitor Discharge stud welder brings the design to reality. Not influenced by variations in power supply voltage. The weld base is always stronger than the stud / base material. Consistent high weld quality and better production rates. WELDCRAFT'S Capacitor Discharge stud welder uses a low voltage electrostatic storage system in which the weld energy is stored in a capacitor of high capacitance. The CD-Studs or fasteners have a small, specially engineered tip at the weld end. Once the welding current and the required spring force is set to suit the diameter of the stud, the fastener to be welded is loaded into the collect of the welding gun and is positioned in contact with the work piece. When the switch on the welding gun is activated to start the welding sequence, the energy stored in the capacitor bank is discharged through the small tip, which rapidly disintegrates, creating an arc, which heats the surfaces of the stud and the work piece. During arcing the stud is kept pressed against the base material by a spring action. When the two surfaces are in contact, fusion takes place and weld is produced between the stud & the work piece, thus completing the total weld process within a few milliseconds. · It is easy to operate with no specialized skill required. · It provides better design and production flexibility. · It is free from deformation, burn through & marking. · It is readily portable or bench mounted. · It ensures leak-proof fastening. · It saves time, labor and cost. · It is highly versatile. © Copyright 2005-2006 WELDCRAFT ENGINEERS.